I was also having an intermittent electrical connection problem which I thought was related to the problematic cord. It turned out to be an unrelated problem with one of the electrical connectors in the center of the machine, pictured above. Part of the plastic clip designed to hold the connectors together was cracked. Unfortunately I did not have a replacement part, so for now I wrapped some electrical tape around the connector to hold it securely together. This seems to have done the job. But the next time something else breaks on this Miele, I will order this part too and replace both at the same time. Sometimes this cord gets tangled and gets cut inside.The cord is tangled and a loop of cord is wedged between the winder reel and the housing. Click for a close-up. 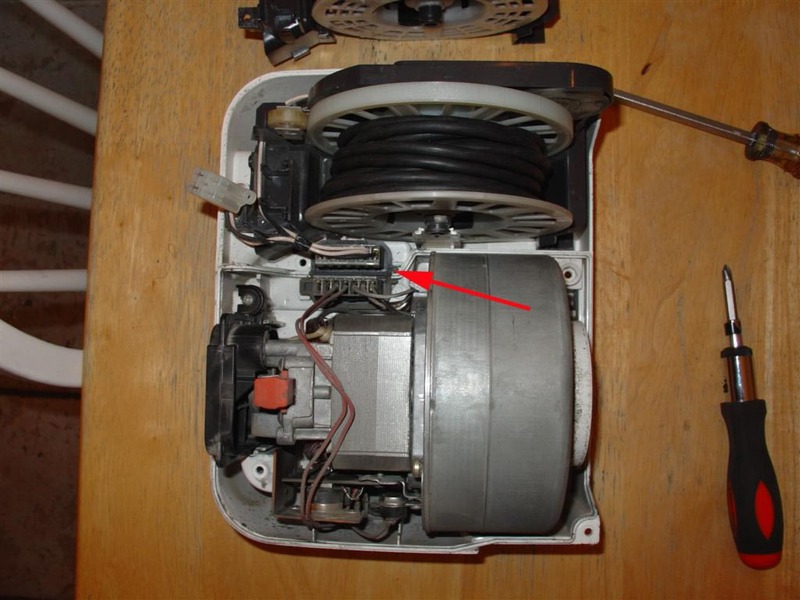 Here is another view of the insides of the Miele with the cord unwound. Click for a close-up of the electronics. If you look closely you can see the electrical tape around the connector at center. Labels: Miele Artico runs intermittently.